Gifts are on my mind. 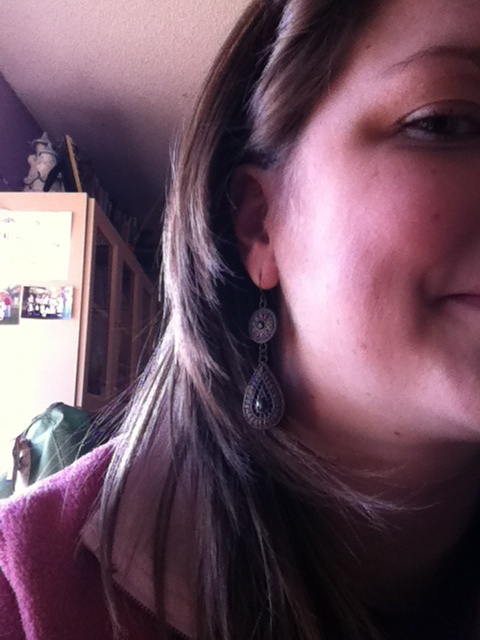 Today, I am wearing these earrings. Joy, my cousin, gave them to me several years ago. I cannot wear them without thinking about her. This is one reason that I love to be on the receiving end of gift-giving. I love to go about my daily business with eyes alighting on things that have been given to me. Although beautiful and useful things bring me delight in themselves, my delight is doubled by the memory of the giver. These earrings (or scarf or garlic press or sparkle pens, to name a few recent gifts) become icons– symbols that I can see and touch, wear and use which remind me of a person. Of Joy, and my relationship to her, of the last time we were together, of the fact that she’s moved to a new city and is undertaking a new venture in her life. The earrings remind me of the unanswered letter on my desk. We just celebrated Christmas, and under my family’s tree were many boxes with bows and tiny tags naming their recipient. There are many voices who cry against the materialism of our society and dismiss the practice of Christmas gift-giving as the invention of the toy makers. At best, it is an ingenious marketing ploy to which we have all blindly fallen prey. At worst, it is a sad attempt to prove our love buying our relative’s affections. Certainly, such opinions have a point, but it seems like a pretty one-sided perspective to me. I don’t want a Christmas that is about the packages under a tree, but neither can I escape the memory that the first Christmas was all about a gift. So to demean and vilify the gift-giving practice, I think, is to throw out the baby with the bath water. Gifts can’t be all bad. The great divine initiative that God took to include us in His family through Jesus Christ is often proclaimed in Scripture as “the free gift of God.” Before the toy-makers ever schemed, His hand was extended in loving-kindness, not to purchase our affection but to offer us something we couldn’t get on our own– fullness of life. In the same way that I can’t wear these earrings without thinking of Joy, I can’t live by grace or walk in freedom without remembering Abba, His tenderness and His great love. To receive gifts is to be human. Premise One: Without examination and reflection (or the direct intent of preservation), all things degenerate. It’s the natural process of an aging, decaying world. Premise Two: To receive gifts is to be human. Conclusion: A blanket censure on gift-giving (whether birthdays, valentines, christmas, etc) is an anxious reaction. There is a discrepancy (and therefore conflict, and therefore anxiety) between the way things/we are and the way things/we ought to be. We are aware of this to some degree on a subconscious level. We can’t handle the anxiety, so gifts get triangulated in and are scapegoated. Not sure I can support that, just processing through some new lenses.